When we go out for Mexican food I always order a side of refried beans. I love how they are so creamy and salty, and unlike anything you could ever get in a can. So when I saw that my friend Sarah was making them at home and raved about them, I knew I'd have to try them. 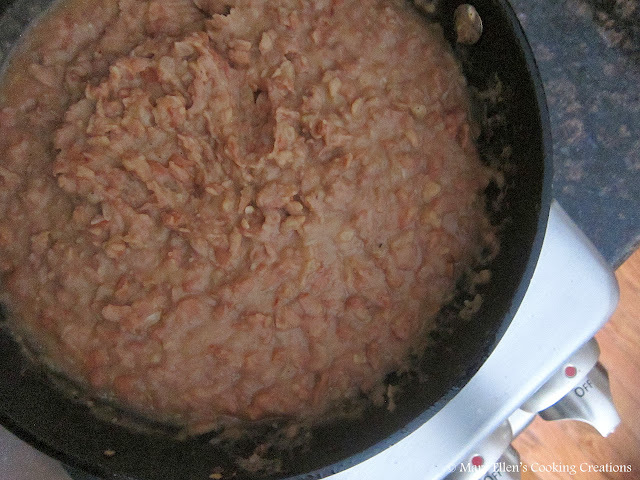 The thought that I'd be able to have authentic refried beans at home made me so giddy! 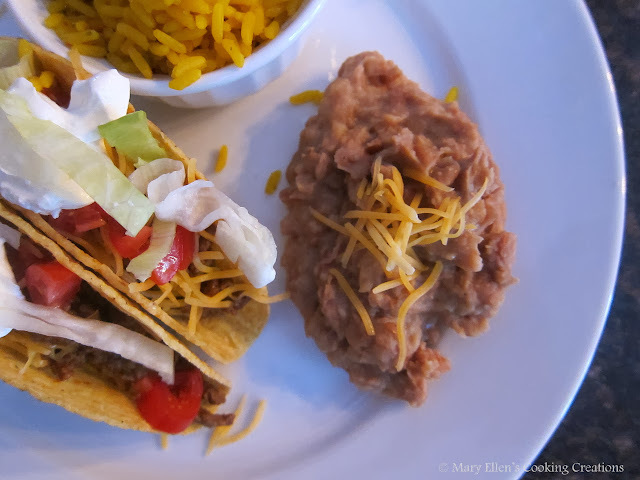 I finally got around to it last week to go with some easy weeknight tacos. I started tasting the beans as they were cooking and couldn't believe how good they were. They really tasted just like beans I have eaten at Mexican restaurants! This is an easy recipe that can simmer as you are preparing the other parts of your meal, and then you just mash them up before you are ready to eat. Below is the original recipe; I doubled this because I knew I'd want leftovers. Add the onion to the pan. Cook until just tender, about 4-5 minutes. Stir in the garlic, cumin and cayenne, and cook until fragrant, about 30-60 seconds. Add the beans to the pan. Season with a bit of salt and pepper (you can add more later, don't oversalt). Pour in 2/3 cup of the broth, bring to a boil, and reduce to a light simmer (do not cover). Let simmer for about 10 minutes or until most of the liquid has been absorbed. Remove the pan from the heat and allow to cool slightly. Mash the bean mixture as desired. For a chunkier texture, use a fork or potato masher (I used a potato masher). For a smoother texture, pulse the mixture in a food processor. Add up to 1/3 cup more broth for a lighter texture and adjust seasonings to taste.